Electromagnetic processing of materials requires generation of magnetic field in a very wide range of frequencies (from DC to several hundred kilohertz) and intensities (up to 12 T). AC magnetic systems are used for material stirring, casting, pouring control, transportation, forming etc. These systems typically may have magnetic circuits made of soft magnetic materials: laminations, ferrites and Soft Magnetic Composites (SMC) also known as Magnetodielectric Materials (MDM). Each type of materials has different electrical, magnetic and mechanical characteristics. This presentation gives an overview of characteristics of different soft magnetic materials and perspective of their use in the electromagnetic processing of materials. Main attention is paid to MDM, a relatively new type of materials. Presentation is based on experience of the authors, literature and discussions with experts in different industries. 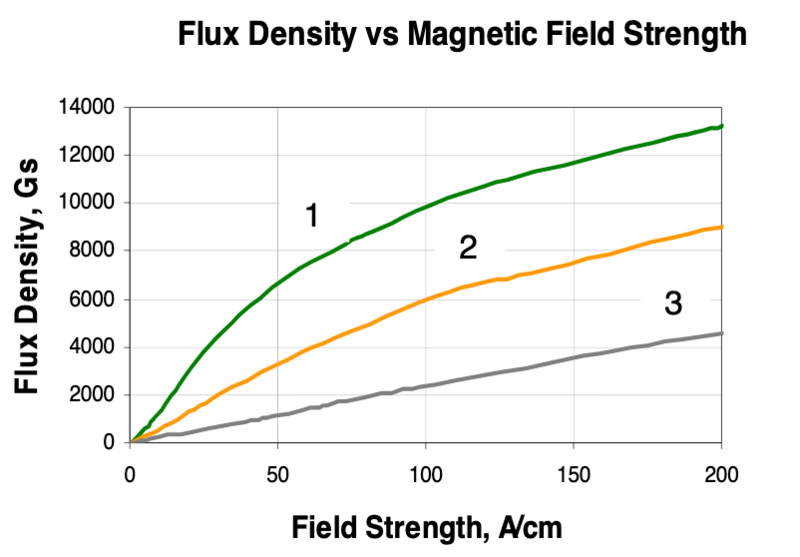 Magnetic fields are being widely used in electromagnetic processing of materials. It is natural, that magnetic field generation and control play a very important role. The goals of control are concentration of the field in some areas, shielding of the others and field distribution according to required pattern. Magnetic field control may be accomplished by variation of the coil turn shape and positioning, by insertion of non-magnetic shields and magnetic templates that may be called magnetic controllers. In different applications magnetic controllers have different names according to their role: concentrators, intensifiers, shields, cores, diverters. Non-magnetic shields, typically made in the form of copper rings or massive copper blocks, are often called “flux robbers”. Their use results in reduction of the induction system power factor and efficiency and they are not considered in this paper. Operating conditions of magnetic materials in EPM is very different than in traditional devises – motors, transformers, chokes, etc. In EPM the magnetic circuits are usually open or have a big gap. This circumstance dramatically changes requirements to material, first of all to its permeability. Special study made at Fluxtrol Inc. by computer simulation and confirmed by experiments, showed that in induction heating system the permeability of 40-50 is typically sufficient for good controller performance . Moreover, in some cases, an excessive value of permeability can reduce the inductor efficiency. At the same time there are new requirements in EPM area compared to transformers etc., such as good performance in 3D fields, low losses at high frequency, good machinability, temperature resistance, etc. A course that contains the basics of magnetic flux control including the theory, methods of simulation and design and application technique guidelines may be found on the company website under the tab Training . This information was developed mainly for induction heat treating but it may be effectively applied to other areas of EPM. The use of magnetic controllers on induction heat treating coils can provide accurate control of heat pattern, improve the coil efficiency and power factor, protect machine or the part components from unintended heating, better utilize power transferred to the part in local heating processes and reduce current demand to the coil thus improving performance of the whole system. In many applications controllers give more that one benefit. It is important to mention also that the controller design, selection of material and application technique can strongly influence lifetime of heavy loaded induction coils . Laminations are manufactured from silicon steel and are this material is traditionally used for magnetic field control in EPM. The main frequency range of their application is below 10 kHz though at times they are used at frequencies up to 50 kHz with reduced flux density and intensive cooling. Laminations have very high permeability with maximum values of several thousands and high saturation flux density (1.7-2.0T). The main drawbacks of laminations are: frequency limits due to magnetic loss increase, laborious manufacturing of complex shaped controllers and poor performance in 3D magnetic fields, where they are being intensively heated by the field component perpendicular to the sheets. Laminations are manufactured in the form of sheets or rolls and may be used for very big cores by means of cutting or stamping and assembling. Ferrites may have very high permeability (in weak fields only! ), low losses and can work in a very wide range of frequencies when properly selected and applied. However they have low saturation flux density and Curie temperature, are very sensitive to thermal and mechanical shocks and may not be machined except by grinding and cutting with diamond tools. For these reasons ferrites are used only at high frequencies in the form of simple shapes – cylinders, plates, rods or relatively small standard C or E parts. MDMs are made from magnetically soft particles and dielectric material which serves as a binder and electric insulator of the particles . They are produced by pressing of different magnetic powders and binders with subsequent thermal treatment according to special technology. Fluxtrol Inc. is a primary manufacturer of SMC. Four grades of materials (Fluxtrol A, Fluxtrol 50, Fluxtrol 25 and Ferrotron 559H) are covering almost all the world’s induction heating market demands. Some properties of these materials are presented in Table 1 and in Fig.1. As it follows from Fig.1, magnetodielectric materials are quasi-linear, especially material Ferrotron 559. Its permeability is almost constant in very wide range of flux densities. More information about materials, their properties and application technique may be found in . All pressed materials have certain anisotropy, i.e. their properties depend on orientation. Thermal conductivity and permeability are higher in direction perpendicular to pressing while electrical resistivity in this direction is lower. Fluxtrol A has the highest anisotropy that must be taken into account in heavy applications (higher frequency and power, longer heating cycle). Ferrotron 559H has low anisotropy. The numbers given in the table represent properties in the favorable direction, i.e. perpendicular to pressing. SMC materials are non-conductive but they are not dielectric materials either. High frequency material Ferrotron 559 has high electric resistivity and in many cases may be applied directly to the coil parts with different electric potentials. One millimeter of Ferrotron can withstand 80 V at frequency up to 500 kHz. Other materials have lower resistivity, sufficient to restrict generation of the eddy currents but they may not be considered as dielectric materials. When applied to the “bare” parts with different potentials, they must have insulating barrier, such as thin film of Kapton or layer of epoxy resin. All these materials withstand temperature up to 250 C for a long time and up to 300 C for a short time, are inert to most quenchants and brazing fluxes. In the case of high temperature environment, the controllers may be coated with ceramics together with copper or separately. If heat removal through the insulation is insufficient, supplementary cooling may be provided by application of water cooled copper sheet to the external surface of the concentrator or by water flowing through the canals in the material. Fluxtrol and Ferrotron materials have excellent machinability and may be machined to any shape. 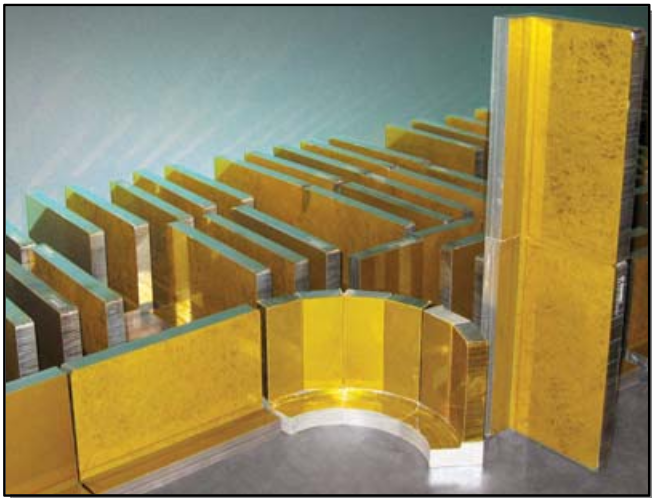 Thin plates with thickness 1 mm or higher are widely used as magnetic shields in narrow gaps of the system. Materials are manufactured in different shapes (rods, discs, plates, custom shapes) and sizes (Fig.2). Maximum diameter of discs is 228 mm and maximum dimensions of plates are 165 x 222 mm. Thickness of plates and discs may be up to 51 mm. In order to serve better for induction market, Fluxtrol Inc. introduced ready-to-use C-shaped concentrators with optimal material orientation. These concentrators are used for direct replacement of C-shaped laminations and are designated as Fluxtrol LRM (Fig. 3). In many applications currents are very high and the system failure happens due to copper overheating and cracking especially when there is thermal cycling. Computer simulation and practical tests showed that application of composite concentrators instead of laminations improves copper life time due to less current concentration of the tubing corners. Another way is to improve heat transfer from copper walls to cooling water. Special tubes with spiral internal ribs can double heat transfer coefficient, Fig. 4. Laminations can experience significant vibration because of magnetic forces and magnetostriction. Vibration can reduce lifetime of the system and cause load noise. Vibration in MDM controllers is much lower due to different structure and materials. Fluxtrol materials were designed primarily for induction heat treating applications but they are already being used for multiple other applications ranging from induction coil shielding to special antennas for oil well monitoring devices. An example of shielding of a furnace for melting radioactive materials in glove box is shown in Fig. 5. When it was necessary to use the same glove box for larger furnace, it was found that only 27% of power would be transferred to the charge. The rest will be lost in the chamber walls and in the coil winding. Application of composite shield around the coil and under its bottom increased efficiency to 63% and significantly reduced the coil current. There is a good potential for wider use of magnetic composites in EPM – from crystal growth to shielding of large furnaces with special atmosphere and big tube welding. An interesting application is shown in Fig. 6. Electrodynamic forces created by magnetic field help to “blow out” excess of coating material (Zn or other) from the surface of galvanized wires or strips. Required frequency is may be high (up to 200 kHz) and composite materials are the only choice for magnetic cores in these applications. Soft Magnetic Composites may be effectively used in many AC magnetic systems especially at middle and high frequencies. They are easily machinable and may be shaped to any geometry, work well in 3D fields, may be used as constructive components of the system. Materials for low and middle frequencies have maximum permeability above hundred, which is sufficient for open magnetic circuits or circuits with big gaps. It is possible to use composites in combination with laminations, e.g. 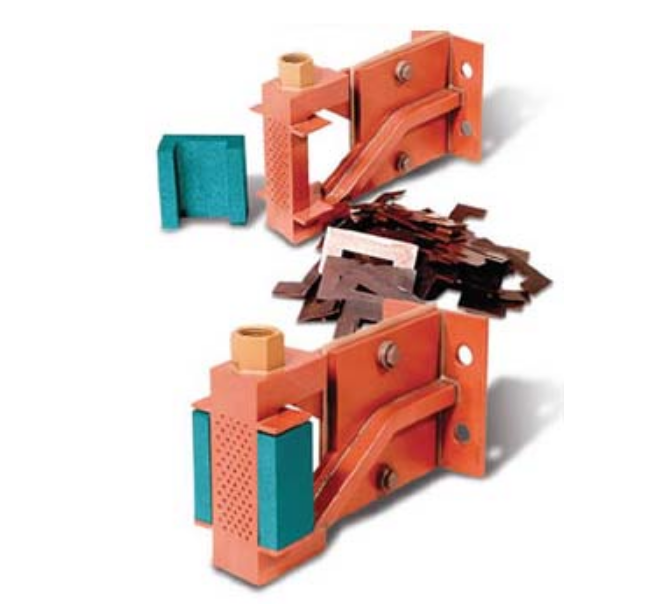 for the end areas of induction furnace shunts, where magnetic filed is essentially 3D.